JFF (Japanese Film Festival) school screenings are exclusive screenings for school groups as part of annual Japanese Film Festival which runs in major cities around Australia. 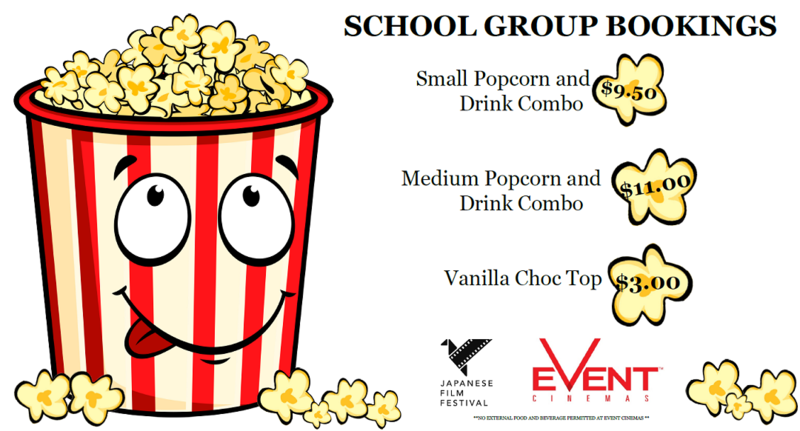 School screenings include a fun Japan related quiz before the film, and make for a great excursion. A Unit of Work on the film will be provided to teachers in advance. The films are best suited for high school students. The 2018 school screening film was the youth-oriented comedy, MY love STORY!!. 2019 screening details will be announced in July 2019. Stand by for updates via the website and J-Teacher newsletter. 2018 bookings are now closed. Click ‘book now’ for your city to book online through Eventbrite. The previous cap of 50 tickets per school has been lifted! Bookings close 3 weeks before the screening date in each city [please check closing dates below]. Bookings made be made by credit card (recommended) or bank transfer. Please note that bookings may close earlier than these dates if capacity is reached. Early bookings are recommended. Adelaide, Brisbane, Perth and Sydney. Please remember that external food and beverages are not permitted in cinemas.